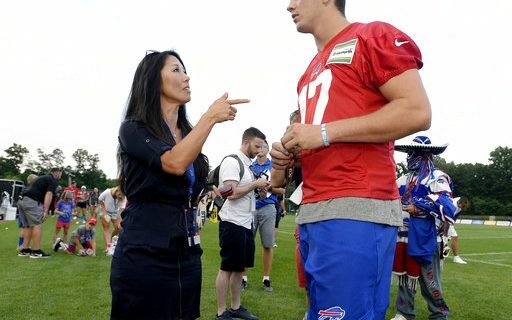 Now that Bills quarterback Josh Allen is settling into Buffalo, and one the brink of being the opening day starter, he’s starting to find a few things that bother him about the NFL. Sports humorist Jeff Wozer has discovered Allen’s biggest NFL pet peeves. • Sideline iPads lack Photoshop. • Training camp dining hall’s “no pants no service” policy. • Won’t allow stylish pleated football pants. • Defensive linemen who rush before counting to three-Mississippi. • Expected to take drunken phone calls in the middle of the night from Roger Goodell wanting to talk about Game of Thrones final season rumors. • Thought NFL would guarantee getting hit on by one of the Kardashian girls. • Instead of calling plays offensive coordinator Brian Daboll complains non-stop about the coaches’ booth limited cheese platter. • Players who use “I was too focused on the game” as an excuse for not wiping down sideline stationary bikes. Speaking of Allen, Jags corner Jalen Ramsey had some critical things to say about the Bills rookie. Jeff has also found out what else is on Ramsey’s to-do list.